The Nursing and Science Building at Rutgers University-Camden will be dedicated on Monday, Sept. 25. It is the most recent addition to the eds-and-meds corridor in downtown Camden. 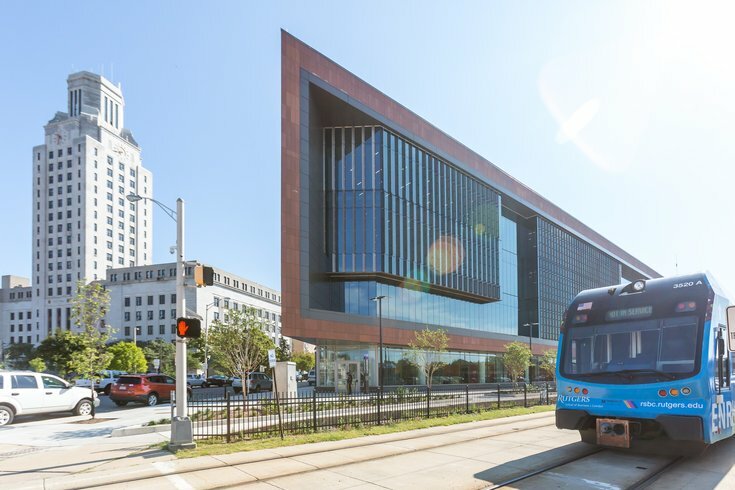 The growing education and medical corridor in downtown will formally add a 107,000 square-foot building on Monday with a dedication of a $62.5 million Nursing and Science Building for Rutgers University-Camden. The high-tech building sits across the street from Camden City Hall. And on Oct. 19, the Rowan University / Rutgers – Camden Board of Governors will break ground on a new health sciences building adjacent to the medical school. Rutgers, Rowan and Camden Community College are all eventually expected to run programs out the building. First-year nursing students, Julianne Molinari, Tara McNellis, and Kelly Drennan, check vital signs during a class held on Thursday, Sept. 21, 2017, at the Nursing and Science Building at Rutgers University–Camden. Nursing isn’t new to Rutgers – it began as a department in 1972 – but demand turned it into a full-fledged school in 2012, according to spokeswoman Barbara McAleese. Nursing is growing with an aging population of patients, changes in how services are delivered and the push to have all registered nurses accredited with a bachelor’s degree, added McAleese. 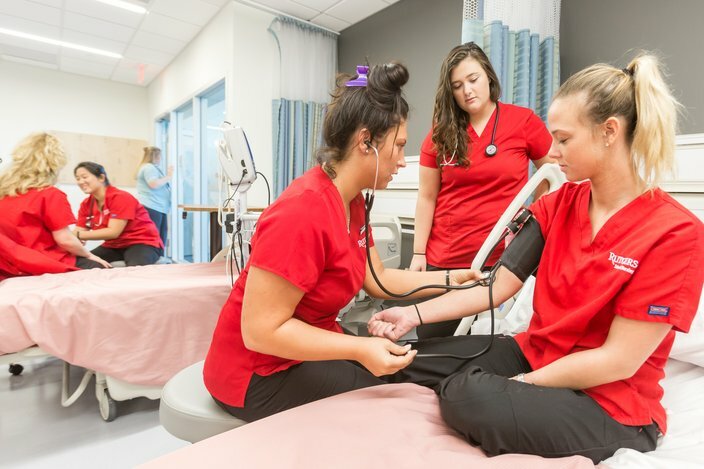 Until the new building opened, the hands-on learning required of nurses was done in reconfigured old dormitories on the main campus, outfitted with outdated hand-me-down equipment. More than 9,000 square feet of labs are outfitted with state-of-the-art equipment to help nurses learn the people skills and interactions need to assure their own safety and their patients in a realistic setting, explained professor Jennifer Sipe, who formerly taught at La Salle University in Olney. She said the patient beds in the clinical competency lab weigh patients and are designed to mitigate against bedsores. A patient simulator room at the Nursing and Science Building at Rutgers University-Camden allows students to practice in a facility set up as a hospital room. This simulation room records the students so they can review techniques in the debriefing facility following the simulated treatment. On another floor of the building, professor Robert Scoloveno oversees simulation labs, where various scenarios can be staged for students. 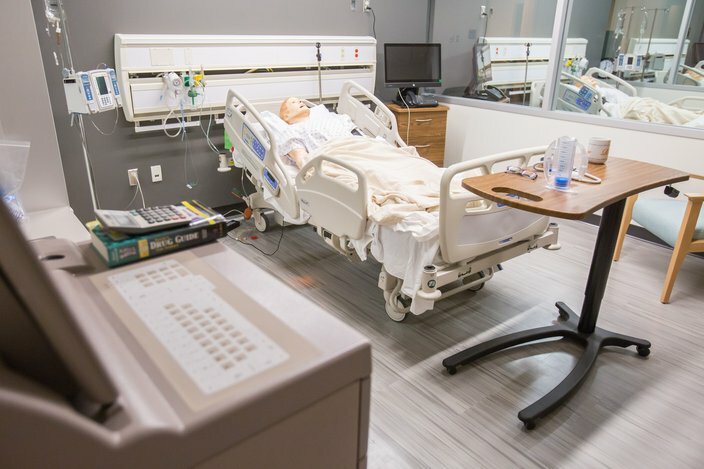 They include video facilities and observation rooms with one-way glass so students can watch and learn as they practice care on dummy patients. Scoloveno said students learn by discovering the critical errors they make by “killing a dummy,” errors they will outgrow by the time they graduate 18 months later. The building is also equipped with long-distance learning spaces, allowing Rutgers to link with campuses in New Brunswick and Newark. Additionally, the science end of the building has biology and physics labs. Because of its location in Camden, which has struggled with poverty and its attendant health problems, the nursing school stresses community-based health care, primary care for the homeless and the challenges of nutrition and obesity, said McAleese. The dedication ceremony is set for 11 a.m. Monday, followed by tours of the building.